White Chocolate Croissant Bread Pudding - Yay Baby! I am having a love affair with Torani syrups. I’ve always loved them for soda bars or to add a little something special to my tea and coffee but my partnership with the brand has challenged me to think beyond the beverage. And I am having so much delicious fun. 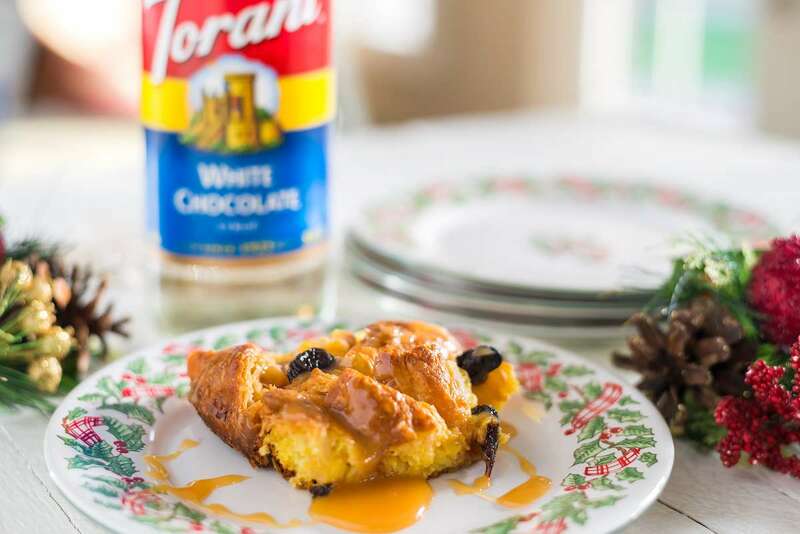 My latest Torani creation is this White Chocolate Croissant Bread Pudding and O-M-G is it a winner. A DELIGHTFUL WINNER!!! 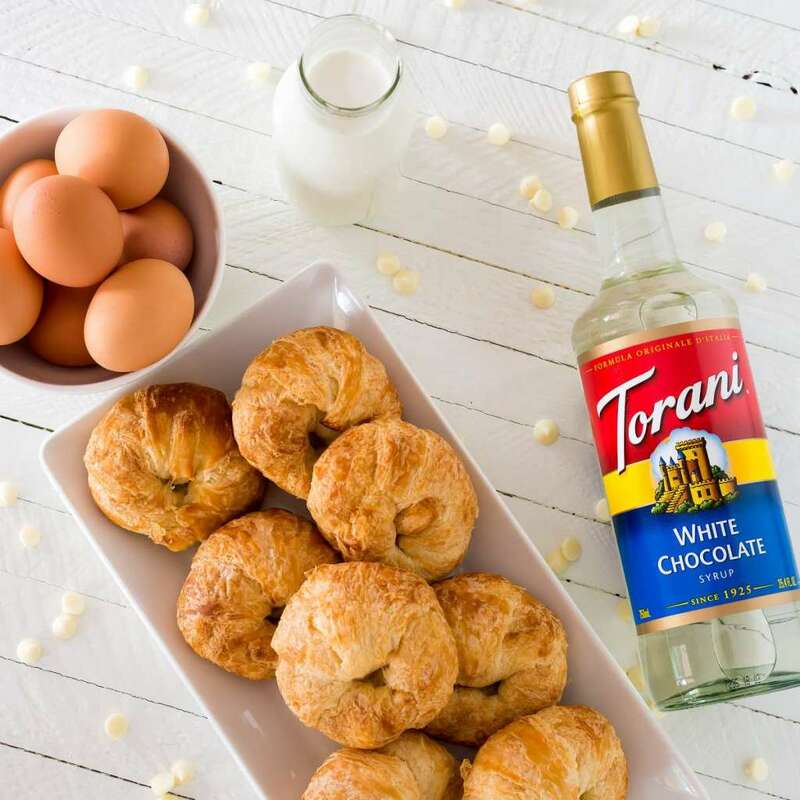 Just a few ingredients and you are on your way to something truly decadent and delicious – croissants, heavy cream Torani White Chocolate Syrup, white chocolate chips and eggs. 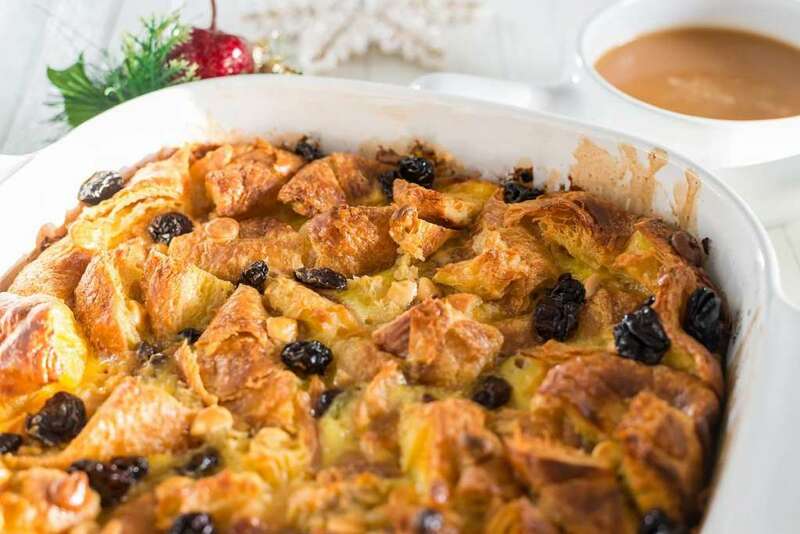 I’ve made this bread pudding with and without dried cherries and honestly I prefer it without; but if you are one that needs the chewy texture dried fruit gives bread pudding – go for it; dried cherries or cranberries go well with the white chocolate. The icing on the cake (literally) for this dessert is a rich, luxurious white chocolate caramel sauce that is so good you’ll want to just eat it with a spoon. Oh, Torani, thank you for adding so much sweetness to my kitchen and table. Cut croissants into large chunks and arrange in an 9″x9″ baking dish. Sprinkle top with 1/2 cup of white chocolate chips and the dried fruit (if using). In a mixing bowl whisk eggs until well beaten. Add 1 cup heavy cream and 1/2 cup of the white choclate syrup and whisk until well combined and frothy. Pour the egg mixture over the top of the croissants. Cover with tin foil and bake for 20 minutes covered and an additional 20 minutes uncovered. Remove from oven and allow to set for at least 15 minutes before serving. While the bread pudding is baking you van make the caramel sauce. Add the remaining white chocolate syrup and cream, white chocolate chips and brown sugar into a small sauce pan. Simmer over low heat until reduced to a thick syrup. 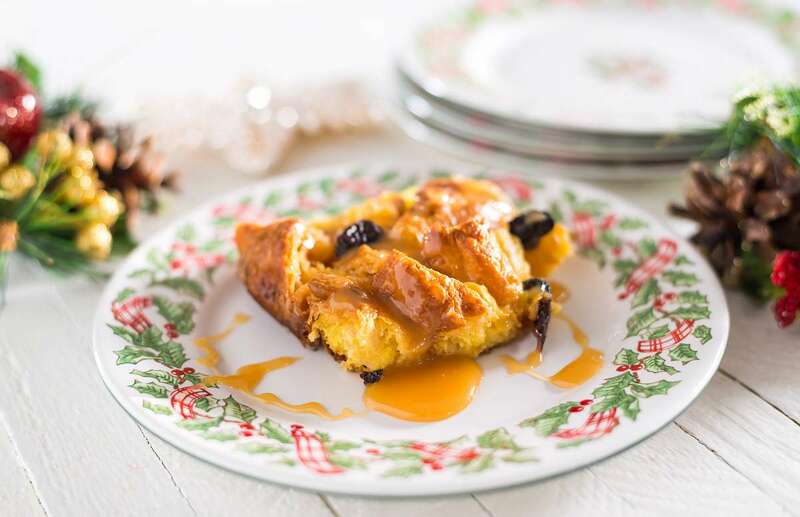 When ready to serve drizzle bread pudding with caramel sauce. Serve will remaining caramel sauce on the side. *Note: Bread puddings should be baked in a water bath to keep the baking even and gentle and not burn the bottom. I don’t have a pan large enough create a water bath so I do it without and have had success. Without the water bath the bread pudding will have a crustier bottom (which I actually like) and the pan will need a good soaking before washing (greasing helps). 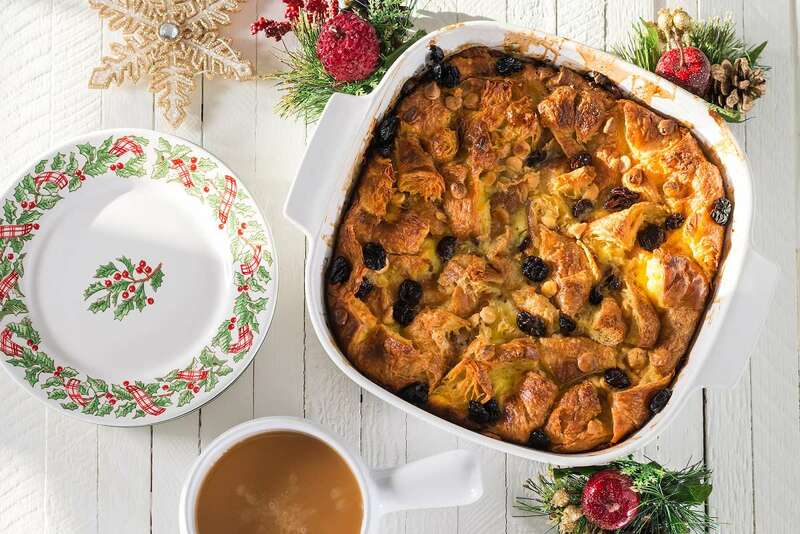 If you have a pan large enough and you want to do a water bath, simply place your bread pudding baking dish into the larger pan and gently fill with water until it comes halfway up the side of the other pan. Carefully place in oven and bake as directed.